Perception (What Is This That Stands Before Me)? Recently, I came up with a brand proposal called T&A (The Little Rock ‘N’ Rollers) that are based loosely, but not too loosely, on Keith Richards’ favourite Telecaster guitars. They also reflect his gorgeous ES-355s in the form of Bigsby vibratos, three-a-side headstocks and 24¾” scaling. I was intrigued whether Mainstream designs could complement one another, aesthetically speaking. Personally, I think they look great, are appropriately named and represent another step forward in my search for the Lost Chord. However, not everyone I showed them to agreed with me. A tiny minority, the purists, felt I had disfigured and devalued a Mainstream sacred cow. As far as they were concerned, the Little T&A’s, as I lovingly refer to them, are not worth a dime. (I also experienced similar disapproval of my 92831 “Fender” concept). Disappointed with their feedback, I wanted to find out why. I started by investigating human perception and cognitive ergonomics. What I discovered was not what I initially perceived! Human perception is an immensely powerful and, therefore, influential parameter when it comes to evaluating, and subsequently, purchasing any number of products, none more so than an electric guitar. In a previous article, I explained, much to the delight of Mainstream manufacturers, that the majority of the guitar buying public can only visualise Fender and Gibson styled guitars as their choice of instruments worth playing. To elaborate further: cognitively, we tend to interpret, formularise and visualise within our own mind what an electric guitar should be, for example her shape, colour and name. Having formularised that expectation, we tend to dismiss any other type of shape, colour and name that does not register with our perceived guitar expectation. In other words, we formulate an opinion based on what we expect to see, rather than what we actually see as for example with the purists and the Little T&A’s. Why do we tend to do this when evaluating electric guitar design? The answer lies with sixty years of Mainstream positioning, familiarity through osmosis and resultant product reverence. Great Design Or A Disfigured Mainstream Sacred Cow? Emulation is also an important cognitive parameter as regards Mainstream perception and recognition. Guitarists, on the whole, want to emulate their heroes by playing the same instruments and replicating their sound. For every Jimi Hendrix fan, for example, the industry has to create a number of Jimi Hendrix influenced guitars; road worn replications or new, with or without reverse headstocks. Talking of Hendrix, my friend and consultant, Gary Grainger, has, pardon the pun, experienced human guitar perception of my very own making. I recently gave him a natural finish, swamp ash Stratocaster with reverse headstock and every time he takes her to a gig, the audience expects him to play like Jimi. At first, Gary was very flattered but it has now reached the point where he is seriously thinking of replacing the neck with a conventional one. Perception is not only related to the guitars themselves, but iconic guitarists too. There is one other important cognitive parameter that I have not yet mentioned: nostalgia or rather our apparent subjective interpretation of it. Initially, rock and roll was perceived to be revolutionary, rebellious and immoral with the aim of corrupting the nation’s youth. The Devil’s music in fact! We have all seen the film Blackboard Jungle. We don’t buy that old establishment, anti-rock and roll propaganda anymore but we still want to preserve it because we believe it is fashionable and cool to do so. We accomplish this in a number of ways. For example, in the choice of clothes we wear, the music we listen to, the bands we follow and the guitars we play. These preferences can all be traced back, directly or indirectly, to the birth of rock and roll. It is all in the DNA and why rock and roll and associated nostalgia are highly marketable commodities. You have probably read a thousand times before that the majority of the guitar-buying public are conservative by nature. They are, in fact, conservative by default. You only have to read this article in order to interpret that statement. There is an old saying in business circles that still rings true today: get to know and understand your customer’s requirements. For as long as rock and roll remains popular, the majority of consumers, for reasons explained, will only want to play Mainstream. I keep getting asked why Mainstream manufacturers do not launch new products. The answer is quite simple: they don’t have to because there is no demand. To put this statement in context: if the automotive industry reflected the guitar industry, we would still be driving 1950s Corvettes and Thunderbirds! Having said that, Fender have recently designed and showcased a number of really cool conceptual guitars that, I hope, for the good of guitar design, enter production. However, don’t be surprised if these concepts never see the light of day again. You may ask, therefore, where is the logic in designing anything that is not Mainstream or Mainstream related? Paradoxically, the answer lies with Mainstream itself. In my previous article on Mainstream familiarity, I explained that guitar perception is slowly changing, as guitarists, tired of Mainstream ubiquity, are looking to play something new. I wrote the word “new” but they are, in fact, looking to play something old! They have rediscovered rare and forgotten US catalogue and European guitars from the ‘50s and ‘60s; instruments I have termed, Alternative Mainstream. To illustrate this growing trend, we recently posted on our website an Aladdin’s Cave of professional guitarists who play them. 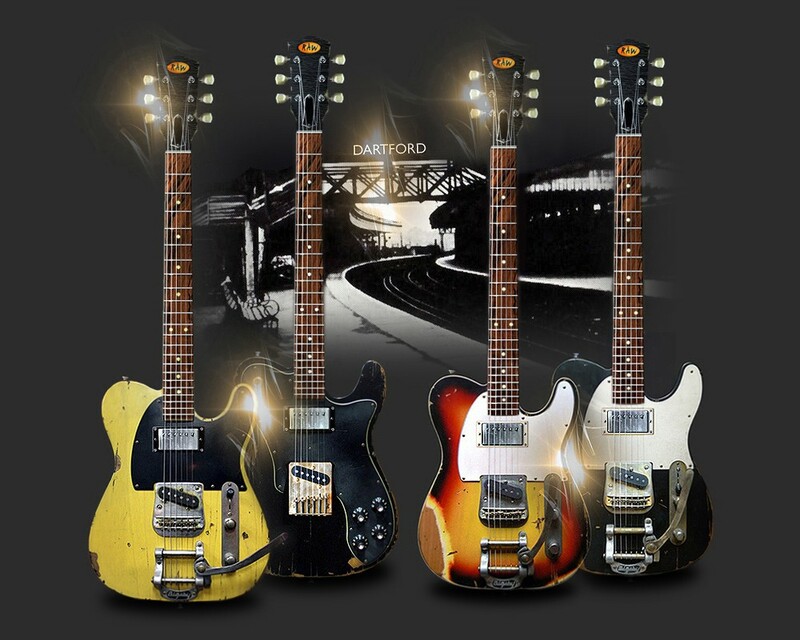 Such is the growing demand for these old instruments, Eastwood are currently leading the way by offering the consumer reproductions at very affordable prices. We love these old guitars too and they are always at the forefront of our creative work and thinking. These old guitars have opened the design floodgates, and when integrated with Mainstream, the possibilities are endless and why we got involved with guitar design. What does the future hold for guitar design and the industry as a whole? Business as usual is the answer. As an ergonomist, I have always been absorbed by human perception because, more often than not, the answers you search for are totally the opposite of what you would normally expect in return. Rationality, metaphorically speaking, is invariably thrown out of the window. If I was discussing any other design-related industry, it would be perfectly logical for the consumer, tired of what is currently on offer, to look at new, contemporary modern design. With the guitar industry, however, the opposite occurs. The majority of the guitar-buying public are quite content looking to the past and purchasing designs that date back to the 1950s and the birth of rock and roll.